It was a Wednesday afternoon and I just so happened to be lurking in the vicinity of the Orbit booth at BEA, as I’d arrived obscenely early for Mira Grant’s signing (Deadline was on the line – I was taking no chances!) when I noticed that none other than the author herself had also arrived with time to spare. 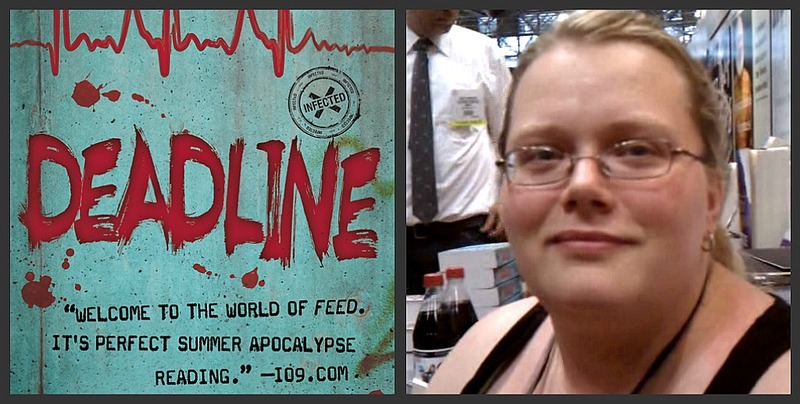 Naturally I pounced – at a speed which I think rather alarmed the Orbit publicists, but as the author of a zombie trilogy, Mira (aka Seanan McGuire) didn’t even bat an eye. And luckily enough, she even agreed to let me steal away her remaining minutes before the signing to talk Newsflesh, Encryptids, and machetes. Now, as with any video stolen in the middle of an expo, the audio is rather noisy – and my cackling is rather disturbingly mad scientist-y – so I also wrote up the interview below, for those who would rather read than listen. Byrt: Seanan, can you tell me how someone can have both a machete collection AND a doll collection? Mira Grant: So if you watch any girl’s cartoons from the 1980’s – My Little Pony, Care Bears, any of that – you will quickly come to realize that all of the censors were so busy making sure that G.I. Joe didn’t shoot anybody, that they let anything pink get away with murder. The My Little Ponies, it’s like Gorman Bechard with hooves. And between that and my absolute passion and love of The Munsters, and desire to grow up to be Marilyn Munster, I think a large toy collection and a large siege weaponry collection pretty much go hand in hand. Byrt: So you have reappropriated pink for the Goth set, is that it? Mira Grant: Essentially… I’m less Goth than cheerfully homicidal. 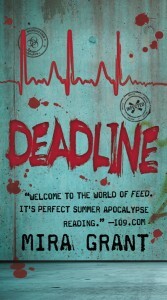 Byrt: Now tell us a little bit about Deadline, coming out May 31, I believe. 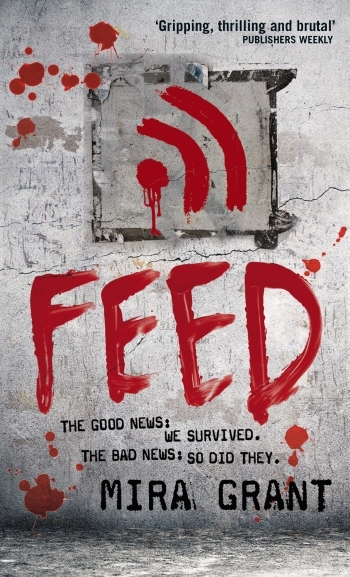 Book 2 – it was a big, shocking ending to FEED, so how do you continue the series after such a big revelation at the end (which I’m trying not to spoil). Mira Grant: Well, after the big thing happens in FEED, there’s some switching up in the primary focus of the books. And it’s that switched focus that maintains through most of Deadline – so at the beginning of Deadline, our point of view character is almost entirely without a purpose, they’re just kind of drifting, they’re not really sure how to deal with themselves or the rest of the world – unfortunately this is not going to keep the world from bringing the dealings to their doorstep. 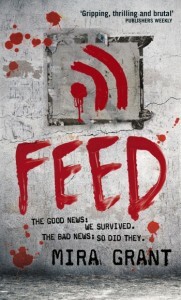 So if FEED was kind of a political science fiction thriller, this is a medical science fiction thriller – so we go a lot deeper into the science behind Kellis-Amberlee, the science behind the zombies, and exactly what it would take to create a virus that somehow didn’t mutate for 20 years. Byrt; I’m such a science nerd – so were you once again spending quality time on the phone with the CDC? Mira Grant: I was once again spending quality time on the phone with the CDC. We think that the NSA probably monitors my phone by now – I’m their equivalent of Comedy Central. Oh, the girl is talking about bursa again. Get the popcorn. Byrt; So are you basically the person to go to – if there is a zombie attack, should we all just run for your house and hide? Mira Grant: No. Because I’ll start shooting you as soon as you get within 20 yards. Just sayin’… If there is a large mob of strangers coming, after the zombies have started showing up, I’m not necessarily going to be the most charitable. But I am a good person to ask if I think the zombie apocalypse has started, during the early stages – now my answer may be no, it’s a tapeworm apocalypse, or a melting bacteria apocalypse, but I can at least tell you it’s not zombies. Byrt: So how close – in terms of the scientific research that you’ve done, how close is your scenario is to something that has happened or could happen in real life? Mira Grant: We have never actually had a genetically modified virus get loose. That is (thank god) thus far completely fictional. But we have had lab accidents; we have had things that were ahead of time – recently in the news, you can actually see kind of a mirror of how the Kellis got released into the atmosphere, in that an old scientific article about a magic bullet cure for cancer got dug up and the media started talking again about oooh Big Pharma is trying to repress this. They’re not even into clinical trials yet! They are so, so early in the research of this particular cure that we don’t know yet if it will cure you and then kill you five years later. So to put it out there – this is a magic bullet and they just won’t share – is irresponsible journalism. And we are now starting to use tailored viruses that we’ve changed around to do things we think would be better for us then what they do naturally. So who knows, give us ten years and we too could be immune to cancer and the common cold – and death. 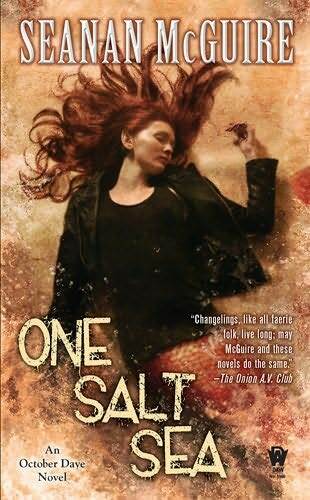 Mira Grant: Well, One Salt Sea, is the fifth book in the the October Daye series – they are kind of stand alone, but I really, really recommend starting from the beginning, just because things do build, one on the other. This one comes after Late Eclipses – Toby is put in the position of actually being in charge of a herd of other Fey for the first time in her life. She’s not too hot on that. And there are mermaids involved – since she’s hydrophobic, she’s the happiest changeling ever. And then, Discount Armageddon, which is coming out in March, is my new series, Incryptids. And that’s kind of Buffy the Vampire Slayer meets the Crocodile Hunter. It’s a family of cryptozoologists who are working to both protect the cryptids of the world from mankind, and to protect mankind from the cryptids of the world. Mira Grant: I’ve been doing a field guide – it involves the taxonomic classifications of all the different forms of cryptid, and coming up with biological justifications. For about six months, my favorite pop quiz was, what makes a mammal? All you need is hair. If you have hair, you can be cold blooded, lay eggs, and sweat milk through your armpits, and you’re still a mammal. Byrt: And you have to breathe air, I think – don’t you? Mira Grant: No, that is not actually considered one of the mandatory requirements. Thus far we haven’t found any non air breathing mammals, but it’s not on the list. Hair is it. So the science is fabulous, but mostly this is more into the urban fantasy side – verging on paranormal romance, actually. I base my seriousness scale – the Mira Grant stuff is a 10, I walk away from those books kind of shaking and I need a week in Disneyworld. The Toby stuff is a 6 or 7, they’re good, they’re fun, but they’re occasionally depressing. And then Incryptids are just there to kick you in the head. Byrt: In a good way. Mira Grant: In a good way. It has talking mice, I’m happy. Mira Grant: Eventually. I am not very good at not going into genres – especially when people say, gosh, you’ll never write a romantic comedy… Oh, give me twenty minutes. Here – it’s called Chasing Saint Margaret, it’s 120,000 words long. Enjoy. Byrt: Are you a workaholic? Byrt: I was somehow getting that impression from you… Now, what – do you have any preparations done for if we do have the zombie apocalypse? Do you have – we all have our earthquake kits in California – but do you have your zombie- your machete set aside and sharpened just for zombies heads? Mira Grant: I do, I have my zombie kit. Because the CDC was right when they recently put out their zombie preparedness plan, that you do- when you put it that way it’s more fun, and you’re more likely to take it seriously, weirdly enough, than if you’re putting together your earthquake preparedness kit. So I’ve got my machete, and my baseball bat, and my MREs and my water purification tablets. You know, all of that fun stuff, and hopefully I’ll never have to use it. Byrt: Does all of this research for this series turn you into a hypochondriac? Byrt: So I’m guessing you’re not going to be writing a middle grade series- no, I’m challenging you now, so you probably will! Mira Grant: Oh, thanks. Thank you for that. That was awesome. Byrt: I would love one, that’s all I’m saying – and unicorns. That’s all I’m saying. Byrt: Alright, well thank you again for taking the time! Byrt: And Deadline comes out May 31st. Thanks again to Mira Grant/Seanan McGuire for not being at all alarmed by my mad cackling! For more on Mira/Seanan, check out her websites here (Mira) and here (Seanan). Once again, Mira Grant shows she is hilarious! Now I want to challenge her to a long dinner conversation about maggots, since I’ve dissected them for years at my day job.. (just re-establishing who is the real bookyurt mad scientist here).